Nell Ingram grew up in a polygamist cult outside of Knoxville, Tennessee. Even though she left them years ago, she still lives right next door. 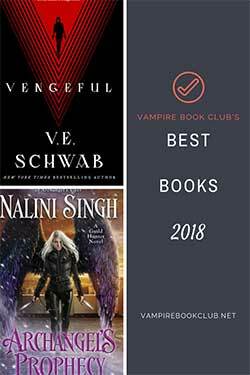 Which is why several months before Blood of the Earth, Jane Yellowrock used Nell’s house as her base of operations while rescuing a vampire from the cult compound. When Jane discovered that Nell was not exactly human, she called her old friend Rick LeFleur at Psy-LED, the supernatural version of the FBI. And Nell’s been waiting for the Feds to show up at her door ever since. When Rick and his were-leopard mate Paka arrive, they once again want to use Nell for her knowledge of, and proximity to, the cult. They believe that a group of kidnappers is hiding out in the compound and need her help to track them down. Of course, it won’t be that simple. The case’s twists and turns will lead Nell to discover how much she wasn’t told about both the church and her family. 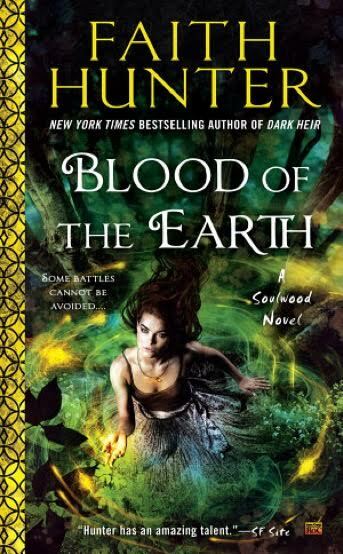 Blood of the Earth and the Soulwood series is a spin-off of Hunter’s Jane Yellowrock series, but new readers should have no problems starting with Blood of the Earth. There are some spoilers for the Jane Yellowrock series, though not for any of the full-length novels. Nell summarizes the plot of the novella Off the Grid, which introduced her character, and the team references parts of Rick’s backstory, which are covered in the short stories. (Those who have read Jane will be particularly gratified by this one thing that Nell does to Rick. I personally liked seeing both Rick and Paka from a different perspective. Nell is especially good at reading people so her insights into their relationship are fascinating. And I’ve always been a fan of Rick’s short stories, which have more police procedural elements than the rest of the Jane Yellowrock series. Soulwood might be the Psy-LED series I’ve been wishing for for years. I loved the new Psy-LED team! They’re a group of misfits just out of the academy who for the most part welcome Nell, despite her differences. 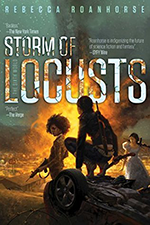 The story also features some of the familiar vampires and weres from Jane Yellowrock, including a few crossover characters, and introduces a few new, and really interesting, creatures. Not to mention Nell, who learns a lot about her magic over the course of the story but still doesn’t really know what she is. It’s fun to watch her overcome her upbringing and start to accept her magic. I’m really looking forward to watching her character develop over the course of the series. I’m a BIG fan of Jane Yellowrock. I was devastated when she and Rick LaFleur broke up and to be honest that’s why I wanted to read Blood of the Earth: I knew he’d be in it. I didn’t want to let him go! BTW, I seem to be in the minority in liking Rick, but I think he got a raw deal in the JY books. He needs to break away from that awful Paka, his were-leopard mate! Anyway, by the time I finished BOTE I knew I had found a new series I will continue with for sure. Nell is a different and fascinating character and I look forward to seeing how she grows into her earth magic and becomes a regular agent of Psy-LED. Faith Hunter is a superb writer, a stand-out in the paranormal book field, and she proves that again in this new series. I always liked Rick too. His short stories were always my faves. He’s having kind of a rough time in this book though. It will be interesting to see what happens with him in this series.